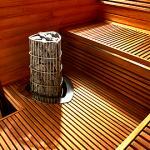 Harvia Kivi sauna heater offers a luxuriously strong sauna experience. You can adjust the nature of the heat from soft to sharp by throwing water either to the side of the heater or straight on top of the stone pillar. The heater offers an enjoyably humid sauna bath even at a moderately low temperature and the warmth lingers long between the stones. Harvia Kivi electric heater produces a traditional soft sauna bath in a modern way. This floor mounted heater model has nearly 100 kg of sauna stones, which is proved to be the correct amount to offer a vigorous heat within a reasonable time. The stones are located in a two-part, triangular steel frame. This stylish and distinguished design makes room for the natural strengths of the stone. Harvia Kivi can be located near the benches for its surface temperature is relatively low. You can also embed the heater to the lower bench with the help of an embedding flange made from stainless steel. 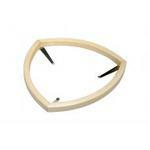 A safety railing made of alder is also available. 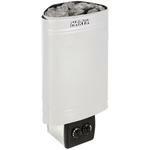 Harvia Kivi heater (models PI70 and PI90) is equipped with a separate digital control panel. This makes heater use extremely easy and, for example, allows you to adjust the temperature accurately – even by just one degree. Control panel can be located in or outside the sauna with a data cable. The length of the data cable is 3 m (with 5 m or 10 m as options). Harvia Kivi models PI70E and PI90E are controlled with a separate Harvia control unit (for example Xafir, Xenio and C150).